Direct Line Insurance has won the High Court's backing in a bid to block a rival's application to trademark a representation of a computer mouse on wheels. Direct Line said esure's mark was too similar to its own, a red telephone on wheels. The court ruled that the trademark application should be refused because its use would take unfair advantage of or be detrimental to Direct Line's similar mark, even though no likelihood of confusion in the minds of the public had been proven. Direct Line's phone on wheels. Direct Line, part of the Royal Bank of Scotland Group, began advertising with its wheeled telephone in 1990. In September 2004, esure, part of the HBOS Group, began advertising with a mouse on wheels, replacing a high profile campaign that featured film director Michael Winner. Esure applied to register its mouse on wheels as a trademark a few days before its adverts campaign began. Direct Line opposed that application. It said the trademark was similar to its own and that there was a likelihood of confusion with its own telephone on wheels. It also argued that the application, if successful, would take unfair advantage of the reputation that Direct Line has in its telephone-on-wheels. While esure's corporate colours are orange and blue, the trademark application, was in black and white. If granted, the mark would allow use in any colour. Direct Line's earlier trademarks were various representations of its telephone on wheels, two of which were red. A preliminary ruling by the Trade Mark Registry found no similarity between the marks and saw no possibility of confusion. Direct Line requested a hearing. In December 2006, that hearing concluded in Direct Line's favour. Esure appealed to the High Court, citing "errors of principle" in hearing officer Allan James's decision. In a decision published on 29 June, the High Court ruled in Direct Line's favour. Without similarity between marks there can be no infringement. Justice Lindsay referred to a previous case that described this as a "threshold test...to be considered in each case by a visual, aural and conceptual comparison of the mark and sign". Lindsay said the threshold is a low one and one that was passed by the similarities between Direct Line's and esure's marks: the services are identical, the marks are indicators of a means of making contact and doing business with each provider, and "black road wheels have been added to that means of communication and give it the appearance of a vehicle". The likelihood of confusion is a different test, though. Justice Lindsay described a "likelihood" as a less stringent requirement than a probability, but he felt it had not been met by esure's mark. He said he found the visual differences "to be so clear and so readily assessable as differences by an average consumer that such a person would not take the respective proprietors of them to be one and the same or, indeed, as economically related to one another but rather that they were more likely to be rivals in one and the same service industry""
Accordingly, esure won part of its appeal: there "was no proven likelihood of relevant confusion", wrote Justice Lindsay. But that finding did not preclude a finding that a mark could cause damage to a rival. On that vital point, esure lost. A branding expert said in an earlier hearing that adoption by esure of a computer mouse on wheels took unfair advantage of the distinctive character of Direct Line's telephone on wheels "by trading off and exploiting, to esure's benefit, the reputation that Direct Line had established in its mark". If Direct Line's telephone on wheels was required to share distinctive features with esure's mouse, he argued, the distinctive character of Direct Line's mark would be so reduced that it would not be wise for Direct Line to continue to promote that mark because it could not be confident that money spent promoting it would not also benefit esure. The hearing officer accepted this argument, describing the link as "parasitic and unfair". Justice Lindsay agreed with this reasoning. He said: "[There] is no necessary inconsistency between, on the one hand, my holding [...] that the public would not regard Direct Line and esure to be one and the same or economically related but rather would be more likely to see them as rivals and, on the other, my upholding the Hearing Officer's decision that were the mouse on wheels to be used as a mark there would, in the public's mind, be taken to be such a link between the two that use of the mouse would be parasitic and unfair." Accordingly, overall, esure's appeal failed. 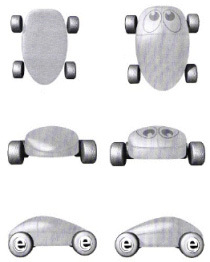 Esure no longer uses the computer mouse on wheels in its advertising, having replaced it with a rodent mouse character called Mister Mouse. According to esure's website, Mister Mouse was designed by the same team that designed Direct Line's telephone on wheels.